British stars Russell Knox and Danny Willett provided a timely boost for European golf with their exploits in Shanghai last week. Knox, who triumphed in the World Golf Championships HSBC Champions, and Yorkshireman Willett, who shot a final-round 62, could both figure in the continent's defence of the Ryder Cup next year. European Tour membership is now on Knox's mind because the American-based Scot has to join to become eligible for captain Darren Clarke's team. Willett, meanwhile, has breathed new life into the Race to Dubai with his share of third place in China. He remains in Shanghai this week, knowing a top-25 finish at the BMW Masters would enable him to overtake Rory McIlroy at the top of the standings. This sets up perfectly the season-ending DP World Tour Championship in Dubai the following week. It is a scenario new European Tour chief executive Keith Pelley would want as he seeks to reinvigorate the Wentworth-based circuit. Pelley is considering changes to the membership criteria to ensure the Tour attracts as many top names as possible. One idea is a restructure that would allow members to compete in only five regular tour events per season. Currently, they are required to play in 13 with the four majors and four WGCs counting in that total. This works for players in the world's top 50 because they are guaranteed entry into the elite eight tournaments. For the likes of Ian Poulter, Graeme McDowell and Luke Donald, who are based in the United States but are no longer in the top 50, it becomes more difficult to satisfy the joint demands of the PGA and European Tours. Knox was in a similar position until his maiden Tour victory in China on Sunday. It was arguably Scottish golf's biggest individual win since Paul Lawrie's Open triumph in 1999 and propelled the Inverness man firmly into the world's top 50. The 30-year-old can now look forward to a Masters debut and entry into the game's most important events. He remains firmly committed to American ways and the former Jacksonville University student, who still resides in the Florida city, intends to stay Stateside for the rest of his life. However he also harbours ambitions to play for the continent of his birth. 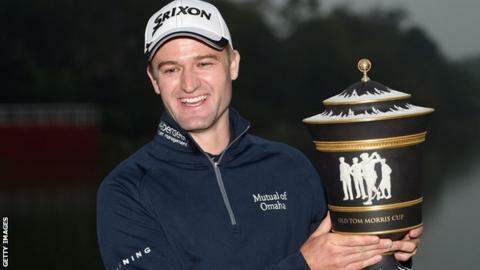 "Absolutely, what an honour it would be to represent Europe in the Ryder Cup," Knox told BBC Sport. "It was kind of close but wasn't really close until this win happened, so I'll definitely have to sit back and look at all my options." The prospect of making an Augusta debut next April has also been on the Scotsman's mind and, by his own admission, almost to a destructive degree in China last Sunday. "It's amazing and actually I thought about that on one hole," he said. "And I yelled at myself 'stop it, stop it, stop thinking about it.' I mean I've never been to the Masters and it'll be a massive dream come true to play there." One of Willett's fondest memories is the arrival of his first Masters invitation at the start of this year. He greeted his postman with gleeful pride when the envelope was delivered. Now he is thrilled to have consolidated his position among the game's top names with sustained excellence in 2015. This was his second top-three finish since winning the European Masters the week after finishing sixth at The Open at St Andrews in July. By competing this week and then in the season finale in Dubai, Willett is playing four straight tournaments in an effort to land the title that reflects performances over a 12-month period. "You keep working hard every day, every hour," Willett told me. "This proves what I did with scheduling and how I've planned the year has come through. "We planned it so I had a good break in the middle of the season when the Ryder Cup qualifying points just started. A lot of people suggested I could fall a long way behind but that wasn't really on my mind. "It was to try to prepare well so that we were fresh to be able to do five out of six weeks now." Willett trails McIlroy by only 74,214 points heading into the final two tournaments on the European schedule. Pelley and his management team will try to exploit the fact that the Race to Dubai is being contested by young and vibrant talent. It plays into the psyche of the Canadian who took over George O'Grady's Wentworth office three months ago. Players, officials and sponsors have been impressed by the energy Pelley has brought to the role. The European Tour boss, along with the new R&A chief executive Martin Slumbers, projected a fresher and more dynamic image when they appeared at last week's HSBC Golf Business Forum in Shanghai. Slumbers talked of making the game more accessible at all levels, while Pelley was in bullish mood discussing the prospects of his tour. "I believe that we are incredibly healthy right now," he said. "And we only have one way to go and that's up." These are laudable sentiments but words have to be backed up by actions. In that regard, the likes of Knox and Willett provide an inspiring example.